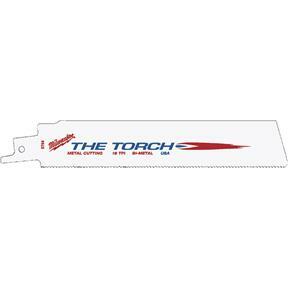 9" Sawzall Torch Reciprocating Saw Blade, 14TPI, 5 pk. 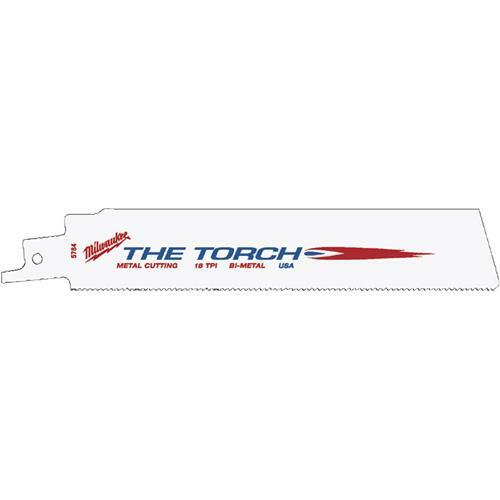 Milwaukee 48-00-5787 - 9" Sawzall Torch Reciprocating Saw Blade, 14TPI, 5 pk. Milwaukee The Torch Super Sawzall five blade pack. Bi-metal construction blades for use on material 3/16" through 1/4" thick. Ideal for demolition, plumbing, remodeling and general metal cutting, these blades will cut pipe, conduit, angle iron up to 4", nail embedded wood, and steel. Torch blades are designed for the toughest Fire and Rescue work, 1" tall for straight, fast cutting and 0.042" thick for longer life with the ability to flex in tight cutting situations. 1/2" universal tang fits all Sawzalls.